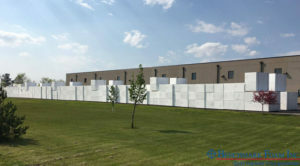 Benchmark Foam has been producing its expanded polystyrene (EPS) geofoam blocks for a Department of Transportation (DOT) project in Sioux City, Iowa. 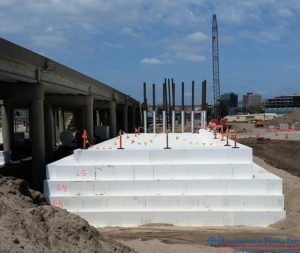 The project calls for geofoam to be used in a bridge replacement as a super-lightweight fill material, which is a common use of geofoam as an alternative to other fills such as black dirt or gravel. Using geofoam is typically more cost efficient and accelerates the overall project timeline with its easy handling. While the Sioux City project calls for more than 8000 total 16’ foam blocks, a portion of the blocks had to be cut to custom thicknesses (6”, 12” and 24”) to adhere to the engineering design. When the Benchmark team was notified of the revised design, it began cutting the blocks to the required size in order to ship in accordance with its On Time Guarantee delivery schedule. (Every order with Benchmark Foam will be shipped and arrive by the agreed-to date or will discount your invoice 10 percent.) Keeping to the scheduled deliveries allowed the crew to install the custom cut geofoam blocks shortly after being delivered. If you’re traveling through Sioux City on Interstate-29, you may see Benchmark Geofoam blocks nearby as the project is slated to continue through the Fall. To learn more about the various uses of geofoam, contact us at 800-658-3444 or 605-886-8084 or via email at epsinfo@benchmarkfoam.com. Our team will be glad to answer your questions and provide guidance in the use of geofoam for your projects.